August 2009 Screaming toddlers and moody teenagers have something in common — they are both emotionally charged. 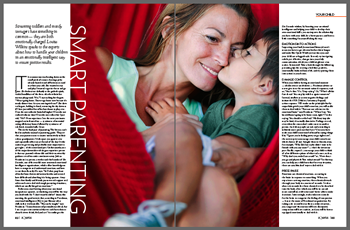 Louisa Wilkins speaks to the experts about how to handle your children in an emotionally intelligent way to ensure positive results. The summer sun was beating down on the small patch of cement, heating up the already heated stand off between me and my three-year-old. She wanted to stay and play. I wanted to get in the car and go home. She looks at me defiantly as she grabs the pink, tassled handlebars of the three-wheeler trike in her nursery playground. “No,” I say reaching for the gate. “We are going home. I have to go home now because it’s nearly dinner time. Are you coming with me?” She darts to the gate, holding it closed, screaming the sky down as if I have just robbed her of her last chance to play, ever. Does she not realise its brain-boiling hot? Does she not realise it’s dinner time? Does she not realise that I just said, “No”? From experience I see the next 30 minutes mapped out in front of me — 15 minutes of torrential crying all the way home, followed by 15 minutes of red-faced, wounded sulk. Great.